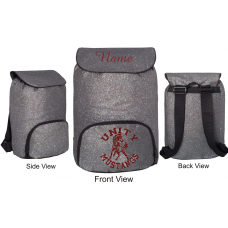 Add some bling to your life with this fantastic backpack! 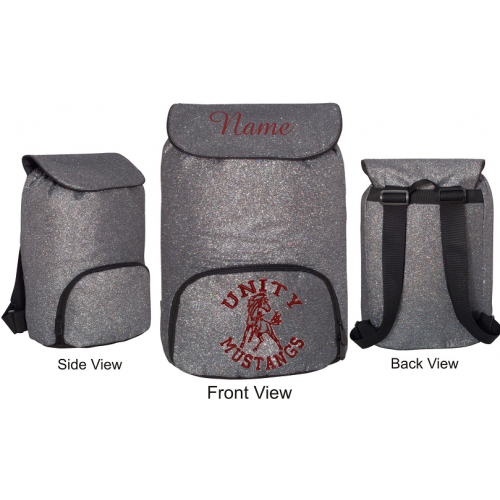 Comes in 60% polyester/40% PPE glitter mesh fabric with a 600-denier 100% polyester bottom. Tunnel drawstring and toggle closure at top of bag. Main flap closure folds over and secures with magnetic snap. Has a front pocket with interior shoe pocket and two heavyweight zipper pulls. Web handle at top of backpack, web straps with adjustable length. Foam padding at bottom of bag to retain shape. Fully lined, 12" x 17" x 8". Comes in silver with Unity logo on bottom flap. Can be personalized with name on top flap for a small extra charge.